Alive Day Memories: New Doc Takes Inside Look at Lives of U.S. Soldiers Wounded in Iraq | Democracy Now! co-director and co-producer of Alive Day Memories. Alpert is also the co-founder and co-director of Downtown Community Television Center and an award-winning journalist. assistant producer of Alive Day Memories and producer and reporter at Downtown Community Television Center. AMY GOODMAN: As General David Petraeus testified on Capitol Hill about the war in Iraq over the past two days, it’s become increasingly apparent the Bush administration plans to continue the war for the indefinite future. Since the U.S. invaded Iraq, up to a million Iraqis have been killed. 3,774 U.S. troops have also died. On Tuesday, the military announced seven members of the 82nd Airborne Division’s 2nd Brigade were killed in a vehicle accident. The 2nd Brigade was the first military unit to deploy this year as part of President Bush’s so-called surge. Ten more soldiers were injured in the accident. Today, we’re going to look at what happens to the soldiers who narrowly escape death in Iraq. Tens of thousands of U.S. troops have been injured in Iraq, and, for the first time in American history, 90 percent of the wounded survive their injuries, but a greater percentage of these men and women are returning with amputations, traumatic brain injuries, severe post-traumatic stress. A new HBO documentary provides an inside look at how the war has permanently changed the lives of these wounded troops. It’s called Alive Day Memories: Home from Iraq. The film premiered Sunday night, is airing again on HBO this Thursday, 9:00 p.m. Eastern. Co-founder of Downtown Community Television Center and award-winning journalist Jon Alpert co-directed and co-produced this documentary. His daughter Tami Alpert is a producer and reporter for DCTV. She also assisted in producing Alive Day Memories. They join us now here in our firehouse studio. Talk about these soldiers, Jon. JON ALPERT: Well, these soldiers are basically your neighbors. These are the people that live next door to you that you might have gone to high school with. But in many cases they can’t walk anymore. They’ve lost their legs. They’ve lost their arms. They’ve lost their sight. And these are the people that have really paid a very, very, very dear price for us. AMY GOODMAN: How did you choose them? JON ALPERT: Well, Tami did a lot of that work, along with Ellen Goosenberg, one of the other producers. But the directive came out from HBO, Sheila Nevins, who runs the documentary division, and Jim Gandolfini, that they wanted to find soldiers and enable these soldiers to tell their stories. And so, Tami went out and started looking for them. AMY GOODMAN: Let’s go to one of them. I want to play a clip from your documentary, Alive Day Memories, of First Lieutenant Dawn Halfaker. She was severely injured in June 2004, four months after being deployed to Iraq. Her right arm and shoulder were amputated. FIRST LT. DAWN HALFAKER: The reality of, you know, will I be able to raise a kid. I won’t be able to pick up my son or daughter with two arms. I won’t. AMY GOODMAN: Tell us about Dawn, Tami. TAMI ALPERT: Well, I had an opportunity to go down and meet her in her apartment. And I think every single person who watches this film has a different soldier that they feel touches them in a particular way. And, for me, I think that Dawn’s story personally affects me, because she’s really a peer of mine, very similar in age. A lot of these soldiers are quite young. That’s basically what our army is today. It’s a very young army. So everybody that I went out to meet was my age or younger, for the most part. And to see somebody who’s in a similar place in their life as me, who doesn’t have an arm and has to live their life like that, it really gives you a perspective change. AMY GOODMAN: I want to play another clip from Alive Day Memories of Private Dexter Pitts. He was seriously injured in January 2005, six months after being deployed to Iraq. He’s 22 years old. PVT. DEXTER PITTS: I’ve done some, like, mean things to kids over there that I had to do. And I tell people some things I’ve done. They’re like, “No, not Dex, man. Not you.” I do what I had to do to survive. I sit there in my bed at night, and everything plays over and over from the first moment, and I hear these Iraqi voices coming towards me. I don’t want to live that life no more and be on my medication every morning that I wake up. When I want to go to sleep, I have to take a pill. I don’t want to live like that, you know? INTERVIEWER: Is this what the Army calls “combat stress”? PVT. DEXTER PITTS: PTSD is what they call it. In the world I come from, in the Army and infantry land, you know, they don’t believe in PTSD. They believe that there’s just weak-minded people, there’s nothing wrong with you. AMY GOODMAN: Explain Dexter’s story, Jon. JON ALPERT: Dexter has had a lot of therapy. Many of the things that he’s seen disturb him so profoundly he found difficulty sleeping. And it’s hard for them to talk about this. It’s hard for them to sort of get back to the normal life, after some of the horrific things that they’ve seen over there in Iraq. He’s going to school, and he’s studying to be a law enforcement official. That’s what he’d really like to do. What was inspiring is the determination of these 10 wounded soldiers to try to get on with their lives. You know, I’ve had some days where I just want to sit down on the subway track and let the train roll me over, and when you think of the courage that these soldiers have shown both in Iraq and here, it’s really inspiring. AMY GOODMAN: Tami, tell us about Bryan Anderson. TAMI ALPERT: Bryan Anderson, I got to meet him while he was still recovering at Walter Reed Hospital. He is a fellow who’s in his early twenties. He lost both of his legs, with just about three inches on either side, and he’s lost one of his arms. And I looked at him, and he really only has two fingers left. He’s got one hand, but three of the fingers are not functional. He doesn’t have feeling in them. And so, basically, he’s hanging onto life with those two fingers. And, you know, I’ve become personal friends with him. Every time he comes to New York, he gives me a call to hang out and get a drink. Working on this project really profoundly moved me. And when I see somebody who is really struggling to make it and just has those two fingers, you have to think about all the soldiers that didn’t make it into this film. And, you know, this is just a sample. AMY GOODMAN: Jon, Alive Day Memories — explain Alive Day. JON ALPERT: Well, Alive Day is the name that’s given to the day that you were blown up. And they basically say that you have a second chance at life, because you should have died. And many of these soldiers, in other wars, would have died. They would have died on the battlefield or somewhere back to the hospital. And it’s used as a therapeutic tool to try and help them. The interesting thing about these soldiers is they want very much to tell their stories. In the beginning, you’re a little bit nervous about asking them to talk about their missing arms, their missing eyes, but they want the American people to hear their stories, because the American people sent them over there, and they want the American people to know about their heroism, but they also want them to know about the horror of the war, the cost of the war. 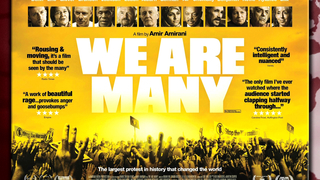 AMY GOODMAN: Jon and Tami Alpert, I want to thank you very much for being here and for doing this film. It’s called Alive Day Memories. It’s airing again on HBO on Thursday night at 9:00 Eastern Standard Time. Thank you so much.